Microbiology and organic fine biochemical CDMO and specialist supplier, BIOSYNTH AG, has more than 100, 000 substances and molecular entities in its product portfolio. Each of them has its own particular applications and story to tell. Here is an example of the molecular entities that BIOSYNTH features on its website every week. This month we are focusing on chrysanthemin as an example of an anthocyanin. Chrysanthemin (BIOSYNTH catalog number Q-100788) is a member of the anthocyanin group of pigments responsible for the colors of flowers, leaves and fruit. Anthocyanins make raspberries red, blueberries blue and grapes green, black or purple. Chrysanthemin’s name is misleading. It is not primarily derived from the chrysanthemum flower but from the roselle plant (Hibiscus sabdariffa, Malvaceae), from different Japanese angiosperms and from Rhaponticum (Asteraceae). Chrysanthemin is one of the most abundant anthocyanins, detected in blackcurrant pomace, in European elderberry, in raspberries, in soybean seed coats, in Victoria plums, peaches and lychees. It is also one of the most potent, coloring the fruit of the smooth arrowwood blue, ‘blood’ oranges red, black rice and forming the major anthocyanin in purple corn. 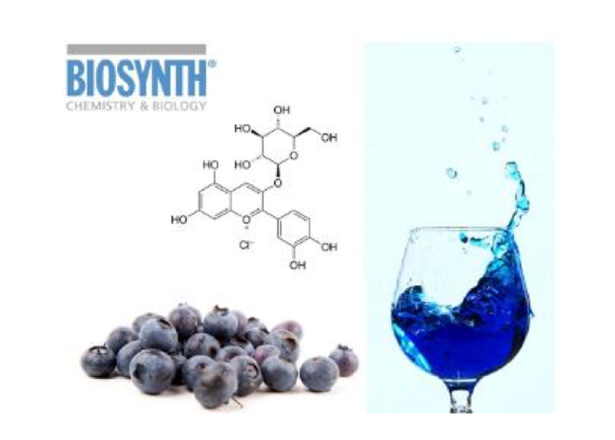 The color of anthocyanins depends largely on their structure (for example on the position and type of sugars attached), as well as on external factors like acidity (pH). One of the main functions of anthocyanin coloring is thought to be to control the plant’s light absorption and protect it from excessive sun exposure. They are also considered to be healthy for human consumption, which is why they form the basis for many natural food and drink colorants. One of the latest applications in this field is the use of chrysanthemin to produce blue wine! Recently, a new blue wine product was invented, which was made adopting anthocyanins and some indole-type compounds in the wine making process. One of the major pigments in chrysanthemin is cyanidin 3-glucoside, which is now known to be closely related to the biosynthesis of the Escherichia coli (E.coli) bacterium. In thale cress (Arabidopsis thaliana), a glycosyltransferase, UGT79B1, is involved in the anthocyanin biosynthetic pathway, converting cyanidin 3-O-glucoside to cyanidin 3-O-xylosyl(1→2)glucoside. Such discoveries are part of much bigger picture in which anthocyanins have long been understood to have therapeutic and nutraceutical properties. These are explored in a recent review (Hock et al., 2017) that establishes how anthocyanidins and anthocyanins are potential pharmaceutical ingredients that give various beneficial health effects. It backs up numerous studies, based on cell culture, animal models, and human clinical trials, that show that anthocyanins possess antioxidative and antimicrobial activities, improve visual and neurological health, and protect against various non-communicable diseases, notably in the cardiovascular and oncology fields. It is generally understood that the therapeutic effects of anthocyanidins and anthocyanins, are due to their potent antioxidant “free radical” properties. Different mechanisms and pathways are involved in the protective effects, including free-radical scavenging pathway, cyclooxygenase pathway, mitogen-activated protein kinase pathway, and inflammatory cytokine signaling. Click on BIOSYNTH Molecule of the Month 01/18: for more information. Click on Anthocyanin properties to access Hock review. Click on BIOSYNTH Chrysantheminto see product details.